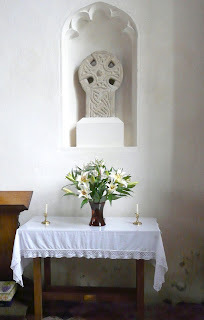 At Whissonsett there is a Saxon cross half as old as the Christian faith. At Mileham a striking new east window. I wanted to see both so I decided to walk. I'd take in the Coke family memorials at Tittleshall and the deserted village of Godwick on the way and make it a way of the cross. In as much as the walk went to plan it was good. The memorials and Godwick village acted as momento mori – reminders of my mortality. The cross and the window (did what all good sacred art does) linked particular times and places to the eternal realities. I particularly like it that Pippa Blackall's stained glass Baptism of Jesus has, in the background , the Lamb of God pastured with Richard Butler-Stoney's Guernsey cows! For all the beauty and meaning of these works of art it was the unplanned elements of the walk that made it a way of the cross. It was such tough going! I had allowed 3 hours to walk the circuit. It took 5! I parked opposite Pentney church and walked back towards Narborough. 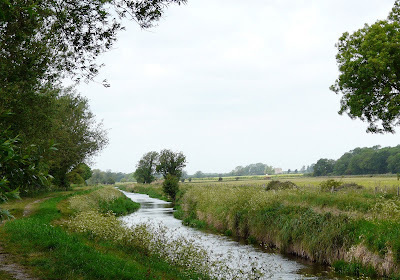 At the first opportunity I turned right and followed a road and then bridle paths down to the river, where I joined the Nar Valley Way and headed west towards Pentney Abbey. The abbey used to sit on an island surrounded by the waters of a tidal creek, where the Nar flowed into the Fens. Today the Fens have been drained, the river embanked and the only thing that’s left of the priory is its gatehouse! But, if you were looking for Norfolk’s version of St. Michael’s Mount, or Holy Island, Pentney Abbey could have been it! At one time the Nar was called God’s Holy River on account of all the religious houses on its banks. It’s still a holy, wild and lonely place. High summer with big blue skies, a warm sun and butterflies and dragon flies on the wing. On such a day I went to Strumpshaw Fen. My intention was to “consider the flowers of the field”. You can go there at anytime of year “to consider the birds” . June is the month for flowers! Strumpshaw Fen’s wildflower meadow is a remnant of, once common, flower rich pasture. Plantlife UK estimate that 97% of the habitat was lost between 1930 and 1980! The names of the flowers are poetry in themselves : - Ragged Robin, Yellow Rattle, Marsh Orchid, Marsh Cinquefoil, Yellow Flag. They were a joy to behold! Soon my attention was taken by the Swallow Tailed Butterflies – what beauty ! 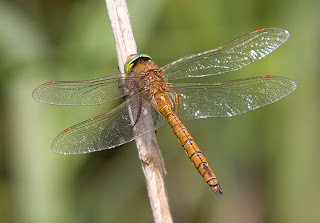 Next it was the turn of dragonflies…….